If you detect a lump, you should act quickly. So should your medical team. Call our Seattle Breast Clinic at (877) 433-9813 or our Federal Way Medical Center at (253) 838-2400 if you detect a lump in your breast, and we'll schedule an appointment. Most patients can be seen for an exam the same day they call. Most breast problems are not cancerous. A clinical exam by a breast health practitioner — and imaging services, when necessary — can help clarify the nature of your problem and bring you peace of mind. At the Breast Clinic, you are in the care of health professionals with a particular interest and expertise in your breast concerns. Virginia Mason's Breast Clinic schedules the imaging services you need — such as mammogram or ultrasound — immediately after your clinical breast exam. 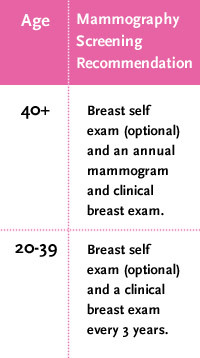 Receive a comprehensive exam with a breast health specialist, and the imaging services you need, in just one visit to the clinic. We make it a priority to schedule you for the most appropriate services at a time that works for you. Most appointments can be scheduled on the same day. Depending on the results of your mammogram and/or ultrasound, we may suggest that you have a needle biopsy. In the rare instance that cancer is detected, Virginia Mason's Breast Cancer Care Program will provide the most advanced, highly specialized care available. To schedule a screening mammogram at any Virginia Mason location, please call (206) 341-1700 or toll-free at (877) 433-9813. For other breast-health concerns, contact our breast care team toll-free at (877) 433-9813.